The following excerpt is from Day 15 of Paula's Lenten devotional: unhurryUp! into Easter: A Lenten Pilgrimage. During this season of Lent we are considering "celebrating" our humanity - and part of that is actually becoming more aware of what we want - and learning to express that to ourselves, to God and hopefully in appropriate ways to others. Sometimes what we really want is hidden beneath our platitudes, our disappointments and our restlessness. How would you answer Jesus' question? So much of my prayer life has been me coming to Jesus telling him what I want, when I want it, who I want it with and where I think it would be best. Some days I'm so busy "talking" that I cannot even perceive Jesus' question... much less know how to answer. I so easily imagine this conversation with Jesus. Jesus: What do you want? Instantly I feel "stuck" in knowing how to answer because I want to answer it the "right" way... instead of paying attention to the deepest longings of my heart. And that I find it difficult to know how to answer, makes me wonder how distracted and noisy is my life that I cannot be in touch with my own heart to know, deep down, what I really want? Or what is it I believe to be true about myself or about God that I don't really feel I have the permission to answer how I really feel. Surely if I was blind or had cancer or needed food for my children I would know what to ask. But how do I "impose" on God who is already really busy taking care of hurting people in Japan, Syria, North Africa and inner-city Portland? The more I journey with Jesus, the more I think this question is quintessential. where am I restless? Discontented? Dissatisfied? In what ways do I need to "see" that a harassed and helpless pace of life is, instead, blinding me? Gamble - Grant, Paula (2015-02-12). unhurryUp! 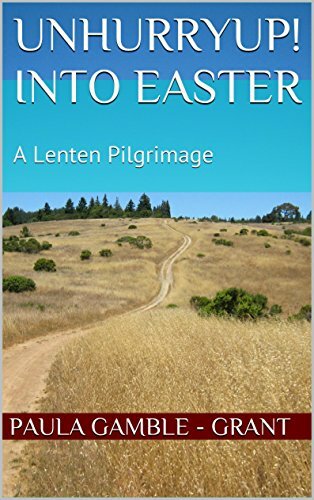 into Easter: A Lenten Pilgrimage (Kindle Locations 912-938). Paula Gamble. Kindle Edition. Grab Paula's devotional by clicking the link below!